Now that you've mastered all those everyday utensils, it's time to get down to some more serious culinary business. We're going to take a look at a few items of equipment that are not necessarily essential in a student kitchen but they'll certainly get some use if you have any foodie inklings. There's no point going out and buying any of these items unless you really intend to use them. However, if you steam vegetables for every meal then you're probably justified in buying a steamer to take with you to university. Be aware, however, that if you're expecting your housemates to chip in for these communal utensils it's only fair to check that everyone is going to get some use out them. Otherwise, it's something that you'll just have to empty your own purse for. Stir-frying is actually a pretty healthy way of cooking and eating so this is a great item to include on your wish list. They're not as expensive as you might think and there are loads of great wok sets on the market now that include a stand, bowls, chopsticks and sometimes some condiments, or a recipe book, as well. Once you've had a bit of practice you'll find that cooking in a wok is surprisingly easy and it's perfect for a quick fix meal. Prepare all your meat and vegetables before you start cooking. Get the oil really hot before adding the ingredients. 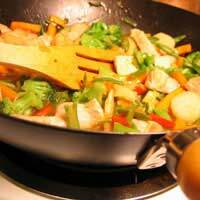 When it's ready, simply add each ingredient to the wok in turn, starting with the one that takes the longest to cook. Stir the food constantly to keep it moving around the wok. In an ideal world, all vegetables would be cooked in a steamer. It's the best way to keep those all-important nutrients intact. Although these huge towers can look a little intimidating to the novice chef they're a lot easier to master than even some of the more conventional cooking methods. You can cook a whole meal in your steamer and it's easy to time it so that everything will be ready at once. Firstly, you need to make sure that the water is topped up to the correct level before you switch on the steamer. Next, check your cooking times. You should have a leaflet giving exact cooking times for different foods - use it! It's important to chop each ingredient into the same-sized pieces so that they cook evenly. Lastly, avoid taking the lids off during cooking, as this will allow the steam to escape. This is a very handy gadget that can be used for all sorts of things from chopping onions to making smoothies. It's also great for making soup - the perfect food for impoverished students. Homemade soup is the perfect way to use up odd veggies before they go past their best. A few herbs and spices or a stock cube will add a bit of interest and the food processor will blend your creation to perfection. It will take less time than an episode of a soap opera and you could have made enough for a week. Make sure you fit the lid on properly - you don't want the walls painted with pureed broccoli and carrot. If you're making soup, blend it in batches, rather than filling the bowl right up to the top. When you're finished, carefully clean all the individual pieces; it can be a bit fiddly but will be ten times worse once the food has dried on. Now we're getting serious! If you're unaware of this particular item of kitchen equipment, it's the heavy, often square, pan with ridges. It's great for cooking chicken, chops or steak as you get the cool lines on your food and it's the closest you'll get to a barbecue experience in the middle of winter. It's also another healthy way to cook, as any fat collects in the bottom of pan between the ridges. If you're cooking meat, drizzle a little oil onto the meat itself, rather than in the pan then get the pan nice and hot before adding the food. If you want the lines don't move the meat or vegetables around the pan, just turn over to cook the other side. There's no excuse now for tuna pasta every night of the week now you've got some know-how of the luxury end of the appliance world. If you do have any of this equipment in your kitchen then don't be afraid to try it out. All these items are really easy to master and you'll be able to create a wider variety of tasty meals if you give them a go.